Home / Adventure Travel & Culture Blog / Southern Patagonia ice field trek – what’s it like? Southern Patagonia ice field trek – what’s it like? Jan and Anne booked a month in Patagonia, including the classic W trek in Torres del Paine, and then a fabulous expedition into Los Glaciares National park and on to the south Patagonia ice field. They rounded of their trip with the Montes Martial trek in Ushuaia. As Jan and Anne live in Edinburgh we asked if they could pop by the office to show us some photos and fill us in on the trip. 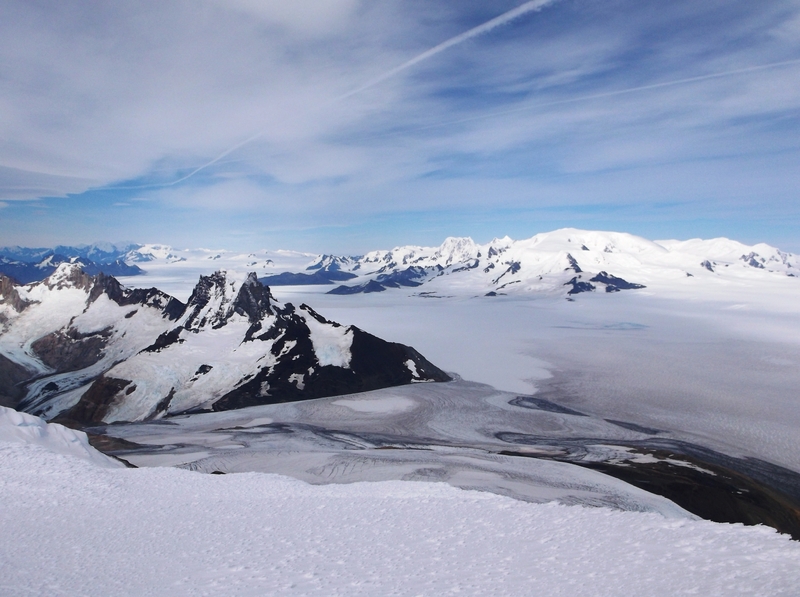 Andean Trails’ director, Kathy, was delighted to have a chance to chat to Jan specifically to find out how he got on with his expedition to the South Patagonian Ice-Cap trek. Andean Trails’ director, Kathy, was delighted to have chance to chat to Jan, just back from his South Patagonian Ice-Cap trek. What was the highlight of your tour to Patagonia? What did you eat on the ice-cap? Breakfast was usually porridge, empanadas, small pastries, and tea. We were each given a small bag to carry to supply us for the 8 days. For dinner the guides cooked for us – mostly soup at 6 pm then another course from dried food, and it was very tasty, a mix of rice, lentils and meat usually. How much did you carry on the ice-cap? It was 23kg and it didn’t feel so bad. The bags were all weighed so we carried the same. I was knackered at the end of each day, it was exhausting but it wasn’t as bad as I thought , to carry that much. It was the tent, crampons and harness that were heavy, the food was OK. I slept 12 hours a night so I got a good rest each day to recover. Some days were nice and gentle too, we were always checking the weather and adjusting the days to fit around rain, wind and sun. What was the highlight of the ice-cap trek? 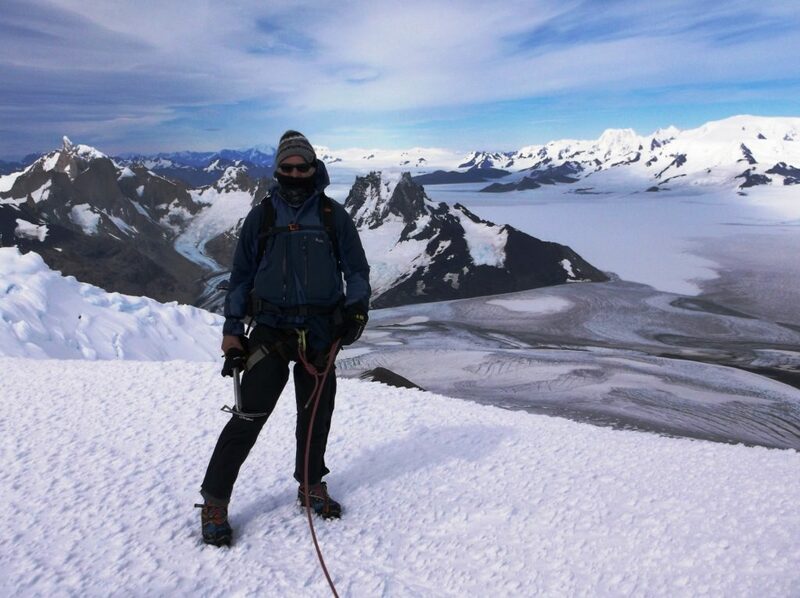 Climbing Gorra Blanca definitely, and the amazing views of Fitzroy and the glaciers – it was fantastic. It was a 6 hour walk – 3 up and 3 down – you can’t walk quickly on the ice, so going down take just as long as going up. Getting over the rocks and boulders in the moraines, and jumping, I have never jumped so much I my life. We had to jump over crevasses (roped up) and also jump over the pols that had formed on the glacier, where pebbles had warmed up and melted holes. The blue ice was beautiful, but the jumping, for 4km wow – I have never jumped so much in my life. I was preparing for an arctic expedition but it felt warm, much warmer than I expected. I didn’t need to zip up my four season sleeping bag, it was never below freezing. Damp was a problem rather than cold. Do you have any advice for others thinking of doing the south Patagonia ice-cap trek? Take quick dry clothing as damp is a problem. Some days it drizzled and getting things dry was an issue, so be equipped to dry clothing. The South Patagonia Ice Field trek takes us up the Marconi Glacier and onto the ice field for several days, away from civilisation and people, on to the third largest single expanse of ice on earth, exceeded only by Antarctica and Greenland. This is one of the toughest treks we offer in Patagonia and way off-the-beaten-track.